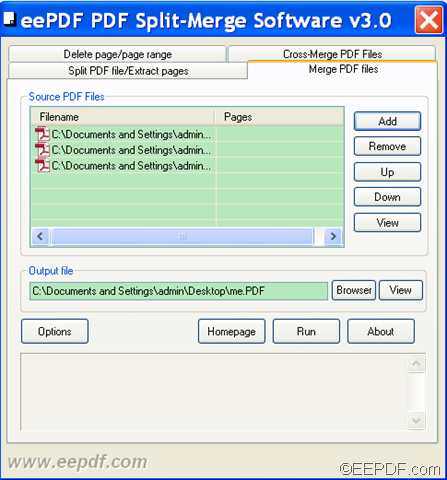 If you want to merge PDF files into a single PDF file, the application EEPDF PDF Split Merge will be a good choice for you. To know how to merge multiple small PDF files into a single PDF file, please do as follows. Firstly, please free download this software by clicking the following button. When you accomplish the download of this software, please double click the downloaded file and follow the setup wizard to install it on the computer. After that, you can add PDF files into the application by using drag and drop operations or clicking the Add button to open the file picker window in which you can choose files. If you want to delete the added PDF files, you can click the Remove button below the Add button. If you want to change the sequence of the PDF files in the processing file list, you can click the Up or Down button. Before merging the PDF file, you can also specify a page or page range for the corresponding file by clicking the corresponding area in the column of “Pages”and then inputting a page number or page range into the edit box. Please see it in the next snapshot. Then, please set an output location for the combined PDF file by inputting a file path in the “Output file” edit box or clicking the Browser button within the “Output file” panel to choose a directory for the merged PDF file. Lastly, please click the Run button below the “Output file” panel to run the process. Several seconds later, you can get the merged PDF in specified location. This is the end of this article and you can get full version of EEPDF PDF Split Merge here. 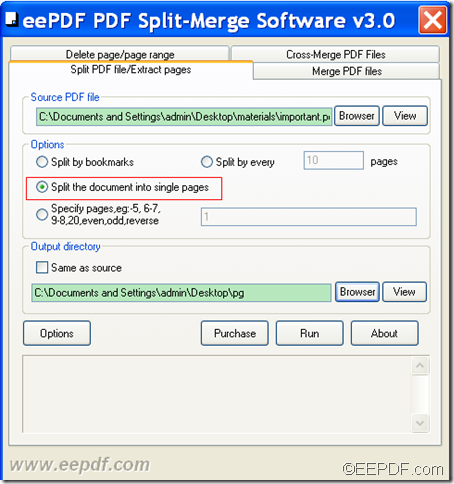 With the help of EEPDF PDF Split Merge, you can delete specific/ even/odd pages from PDF. 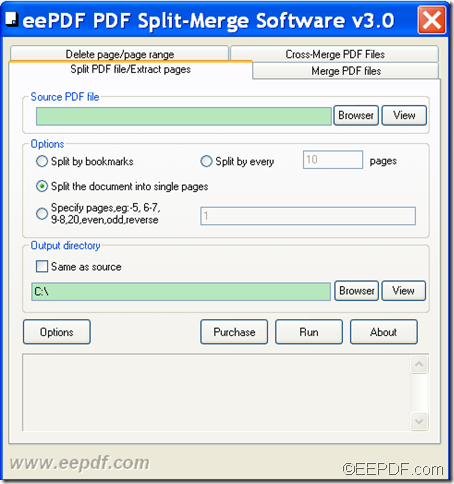 EEPDF PDF Split Merge is a powerful application. It can not only split PDF into small parts, but also it can merge multiple PDF files into one PDF. In addition, it can help you remove a specific page, page range, even pages, odd pages, etc. from a PDF file. Just by following the steps below, you can successfully delete specific pages from a PDF document. Please download the installer of this software via clicking the following button. After the download, please double click the installer and follow the setup wizard to install it on your computer. Please open the software and you can see its user interface on your screen. There are four tabs which will direct you to the corresponding panel on top of the user interface. In the “Split PDF file/Extract pages” panel, you can split a PDF file by bookmarks, every N pages, specific pages, etc. and split a PDF file into single page PDF files. In the “Delete page/page range” panel, you can delete useless pages from a PDF file). In the “Merge PDF files” panel, you can merge PDF into one PDF. In the “Cross-Merge PDF Files” panel, you can cross-merge two PDF files. Since the default panel is the “Split PDF file/Extract pages” panel, you need to click Delete page/page range tab to switch to the deleting pages option. To add PDF into the application, you can directly use drag and drop operations. Or you can also click button Browser beside “Source PDF file” edit box to open the file picker window in which you can choose file. In the “Output directory” group box, please set an output folder for the output PDF. At last, please click the Run button to start to delete the PDF pages. Several seconds later, you can view the target PDF in specified folder. 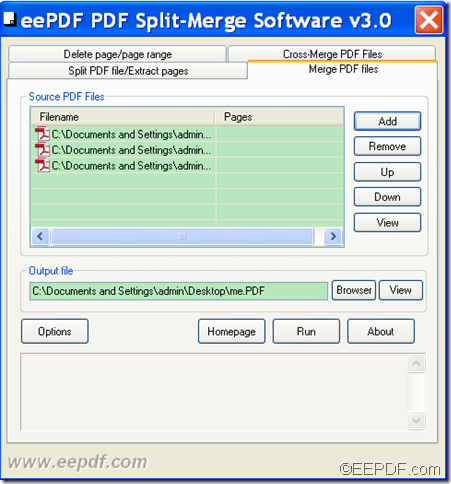 The Windows application EEPDF PDF Split Merge allows you to split multipage PDF into single page PDF files. In our daily life and work, we often use PDF (Portable Document Format) to share and exchange information. However, we may come across many large-size PDF documents which are hard to upload, send, etc. In this case, EEPDF PDF Split Merge helps a lot. It is a multifunctional can be used as both PDF slitter and PDF merger. It can not only split PDF by bookmarks, every N pages, single page, specific pages, etc., but also it can merge several small PDF files into one PDF. In the following contents, you will see how to use this smart application to split a multipage PDF document into small parts. Please click the following button to free download the installer of this application. Then, please double click the downloaded file and follow the setup wizard to install it on the computer. During the instillation, please allow it to create a shortcut icon on the desktop for your use convenience. Drag the PDF and drop it into the application. Input the file path of the PDF document into the “Source PDF file” edit box. Click the Browser button beside “Source PDF file” input box to open the file picker window in which you can choose file. In the group box of “Output directory”, please set an output location for the separated PDF files. You can save them in the same directory as the source PDF file by checking the radio button of “Same as source”. You can also click the Browser button within the “Output directory” panel to choose a new directory for the output PDF files. At last, please click the Run button below the “Output directory” panel. Then, it will start to split the PDF document into single page PDF files automatically. A few seconds later, you can see the split PDF files and upload, send and share them online easily. Thank you for reading this article and you can get full version of EEPDF PDF Split Merge here. If you want to split PDF into small parts so that you can easily upload, send, etc. them, the application EEPDF PDF Split Merge will be a good choice for you. PDF can transfer data electronically without making any changes to the text, image, and format, etc. Thus, it is widely used for sharing and exchanging document among friends, colleagues, business partners, etc. But a big-size PDF file may suffer from issues as the server and applications may refuse to transfer heavy documents. To deal with this issue, you can try to split the large-size PDF files into small ones. 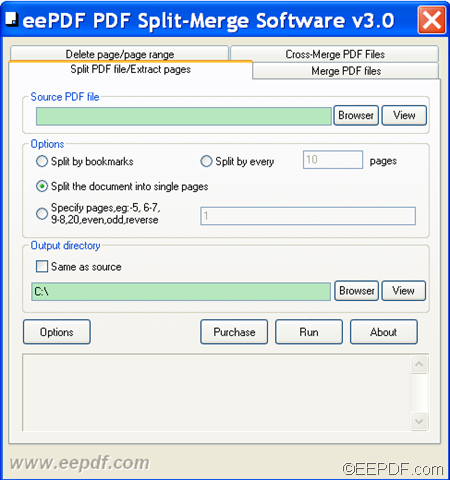 EEPDF PDF Split Merge is a professional application that can split multipage PDF file into multiple small-size files by bookmarks (navigational links to content or points of interest within the document, which can help reader to quickly locate and link to a special part of the document. ), every N pages, specific pages, etc. To know how to split a multipage PDF file with this application, please do as follows. Firstly, please feel free to download this application via clicking the following button. When you accomplish the download, please double-click the installer and follow the setup wizard step by step to install this software on your computer. After you finish the installation, please open it and you can its user interface on the screen. Please see it in the next snapshot. Then, you can click the Browser button beside “Source PDF file” input box to add a PDF document into the application. In the “Options” group box, please choose a mode to split the PDF document. If you choose “Split by bookmarks”, it will split the source PDF file using its bookmarks as cut-points. If you choose “Split by every…”, it will split the PDF every N pages. You can also choose to split the PDF by specific pages. In “Output directory” group box, please set an output location for the separated PDF files. Lastly, please click the Run button to start to split the PDF into single files. Several seconds later, you can view the split PDF documents in specified directory. 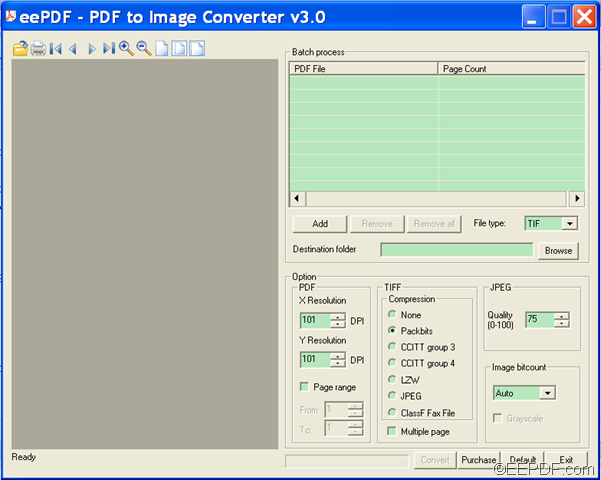 The Windows application EEPDF PDF to Image Converter enables you to convert password PDF to image (JPG/BMP/PNG/GIF/TIF). In our daily life and work, we may come across many PDF (Portable Document Format) documents. Sometimes, it’s troublesome to open PDF documents because you need to have Adobe Acrobat Reader installed. What’s more, sometimes, the PDF documents may be password protected, which makes open them more difficult. 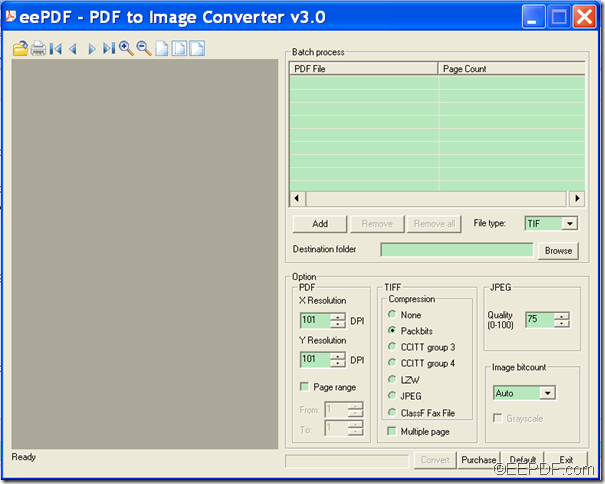 At this time, EEPDF PDF to Image Converter helps a lot. It can directly convert password protected PDF documents to images (JPG, BMP, PNG, GIF, TIF, PCX, etc.) that can be opened by many common applications. In addition, it allows you to set image resolution, color depth, etc. for the converted images. Just by following the steps below, you can successfully convert password encrypted PDF documents to images. At first, please click the following button to download this software. After the download, please double click the installer of this software and follow the setup wizard to install this software on your computer. When you accomplish the installation, please open this application and then you will see the GUI interface of this application. Please see it in the following snapshot. Then, you can add password protected PDF documents into the application by clicking button Add in the middle of the interface to open file picker window in which you can choose files. For PDF documents protected with owner password, it can directly convert the PDF documents to images without requiring the password. In the drop-down list of “File type”, please choose a target image format you need. In the “Destination folder” edit box, please input a file path for the converted images. You can also to set a destination location by clicking the Browse button beside the “Destination folder” edit box to open file picker window in which you can choose a folder. At last, please click button Convert at bottom of the GUI interface to start to convert the password protected PDF files to images. A few minutes later, you can get the converted images in the location you specify. Thank you for reading this article and you can get full version of EEPDF PDF to Image Converter here.